What is the Best Feng Shui Color for Bedroom? Both Uncle Dixer and I get this question from time to time. The short answer is NO, there is no single best Feng Shui color for the bedroom. 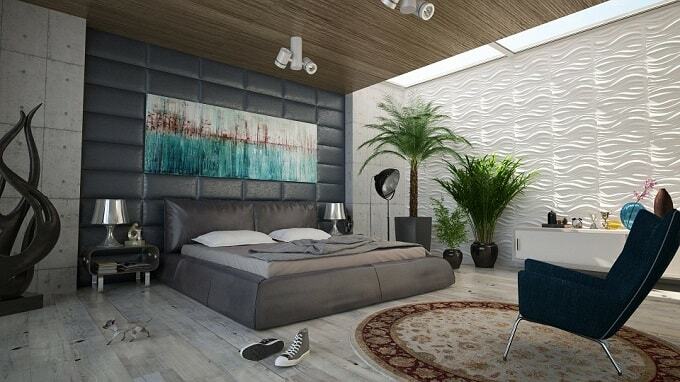 In fact, many colors are suitable for your bedroom, which you’ll find out why in this article. Plus, I think the Feng Shui effects of using colors are minimal. Don’t get me wrong. I wrote about Feng Shui colors and how they impact on our emotions, so I know colors DO have an impact on us. As for its influence on your home’s Feng Shui in terms of health, wealth, and relationships, I have my doubts. Let’s start with what Uncle Dixer has to say about the best Feng Shui color for the bedroom. A reader of Feng Shui Nexus asked Uncle Dixer: What is the best Feng Shui color for our bedroom? “Best color for the bedroom would be colors that are calm, relaxing and helpful for falling asleep. Loud colors like red and bright orange should be avoided. I totally agree with Uncle Dixer. On a side note, I am NOT Uncle Dixer. You can see who he is here. But what about other Feng Shui experts around the web? What do they say about Feng Shui bedroom colors? Most websites you see online will tell you the same thing – adjust your bedroom’s Feng Shui colors according to where it is on based on the Bagua and its relative “element”, based on the Five Elements theory. 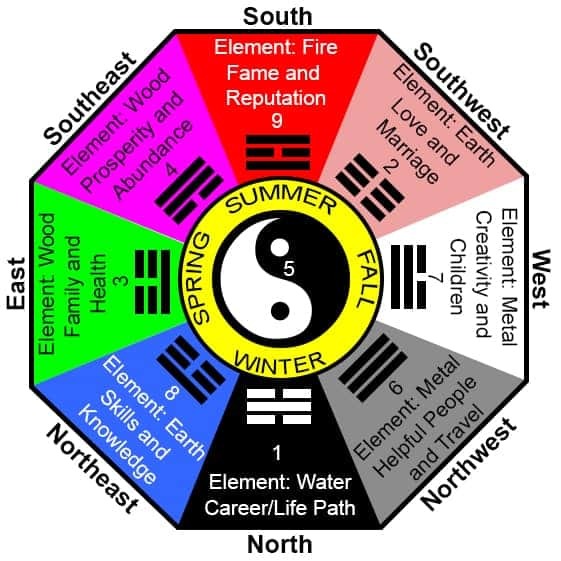 The basics of a Feng Shui Bagua. Second, find out which Bagua sector your bedroom belongs to. The easiest way to do so is to use your floor plan. 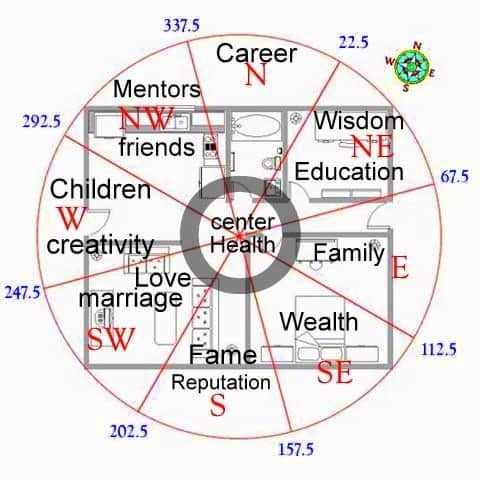 Find out where North is on your floor plan, then overlay the center of the Bagua with the center of your house, matching North with North. Finally, look for your bedroom and determine what sector of the Bagua it belongs to. Feng Shui Bagua applied onto a floor plan. Third, find out which element the Bagua sector is associated with. For instance, a bedroom in the Southwest sector has the Earth element. Then, you’ll use colors consistent with Earth or supports Earth for your bedroom. Most sites will use this method to determine your “best” Feng Shui bedroom color. However, I want to point out this is the method of the Black Hat Feng Shui. This is a sect I don’t practice because of my doubts in its efficacy. However, these experts do bring up a very good point – colors you choose for your bedroom should correspond to what you’re trying to achieve. For instance, red can invoke romance, whereas green and blue can cool things down. So, there’s really no “best” color for the bedroom, although I did notice most experts recommend skin toned color. Just know that color selection depends on your goals and the location of your bedroom relative to the Bagua and the element associated with that direction. Just like using the Bagua, there is NO single best color based on the Yin Yang theory. For those of you not familiar with Yin and Yang, I recommend that you read this guide about the Yin Yang Theory. Based on this theory, the best bedroom color should be more “Yin”. That’s because the bedroom is a place to sleep and relax, both of which belong to Yin activities (as opposed to the active areas like the living room or dining area, which belong to Yang). What colors are Yin? They are colors that are soothing and relaxing, which include but not limited to blue, green, and gray. 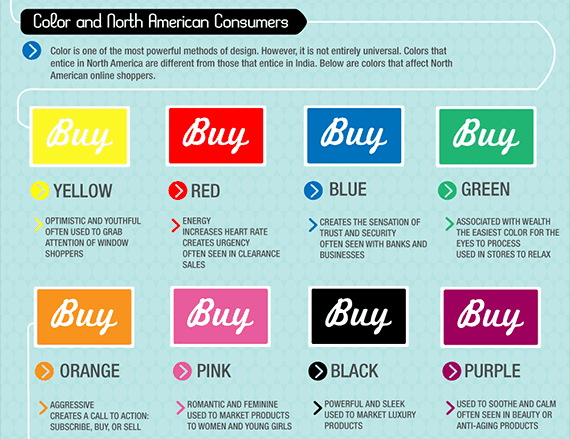 Colors that elicit strong emotions should be avoided. These colors include, but not limited to, red, orange, bright yellow. How logo designs use color for branding. Image credit: The Logo Company. As you can see, some colors bring more energy and is not suitable for the bedroom because it can disrupt sleep and relaxation. For instance, many reliable sources agree that seeing red can increases heart rate. Though it might help with romance in the short-term, it can also mean that it’ll take you longer to fall asleep. A prolonged sleep deprivation will cause all sorts of problems, including inability to focus at work and mood swings that can damage relationships. However, there’s another IMPORTANT factor to keep in mind – light intensity also affects the level of impact colors have on you. 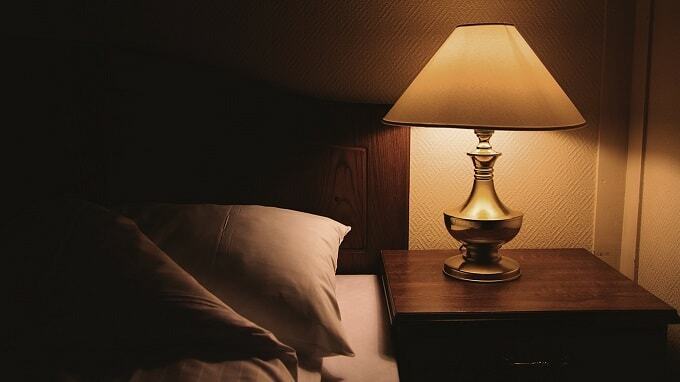 A dimly lit bedroom can help promote sleep and rest. For instance, if your bedroom is dimly lit, a bright red bedsheet may seem maroon. The maroon color will not give us the same energy effect as bright red. A bedroom that’s dimly lit also means that it has more Yin energy than Yang. Classical Feng Shui makes little to no mention about bedroom colors (although there are references to colors in other areas). The classics are all about Qi mapping, energy flow, and how to retain those Qi to benefit the occupant. There’s heavy emphasis on the location of the bedroom relative to the house. There’s also emphasis on where the bed is located and whether there are any negative Forms in the bedroom. Although some practices use colors to enhance the element of the Kua sector of where the bedroom is located (each direction and sector has a Kua, similar to the Bagua), those are more of a modern practice. The color theme should be neutral to soothing that promotes sleep and relaxation. You can choose the colors that honor the elements of the Bagua. It is also VERY important that you are comfortable with that color. Red can be added, but NOT as the main color-theme. Perhaps a red pillow here and there would do just fine to spark a little romance. Light intensity of the bedroom affects how we perceive colors. The bedroom should be dimly lit to bring more Yin energy to promote sleep. By now, you probably have a few colors in mind to spruce up your bedroom. The question now is, what kind of Feng Shui results can you expect from using these colors? Question for you: do you think adding or changing up the colors in your bedroom can help you enhance wealth, improve health, and build relationships? I really hope you answered NO. Adding colors to your bedroom won’t bring you the desired Feng Shui benefits. If Feng Shui was that easy, there’s no need for Feng Shui schools! Further, everyone should be enjoying endless abundance in health, wealth, and love if Feng Shui can simply be adjusted with colors. What bedroom colors can give you, instead, is better sleep and PERHAPS a short-term boost in romance. Please, don’t expect anything more than those. When selecting the color themes for your bedroom, be sure to choose a soothing color that promotes sleep and relaxation. You can also choose the color themes that adhere to the elements based on the Feng Shui Bagua. Just keep this in mind – there is NO single best bedroom colors. If I were to pick a single best color, then it is the one that I like and enjoy looking at on a daily basis. However, simply adjusting your bedroom based on colors cannot bring you the desired Feng Shui benefits. Colors cannot bring you lasting health, wealth, or love. But bedroom colors DO have an impact on us because it affects our sleep quality. Here, I need to emphasize that sleep is VERY important. In fact, a lack of sleep or poor sleep quality can lead to inability to focus, heart diseases, weakened immunity, and much more. Have you tried to Feng Shui your bedroom with colors? What were the results? Share your experience with us by commenting below!